Standard VeeJet spray nozzles feature a high impact solid stream or flat spray pattern with spray angles of 0 to 110 degrees at 40 psi (3 bar). They produce a uniform distribution of small-to medium-sized drops. Specially tapered spray pattern edges provide even spray coverage when several nozzles with over-lapping patterns are required. 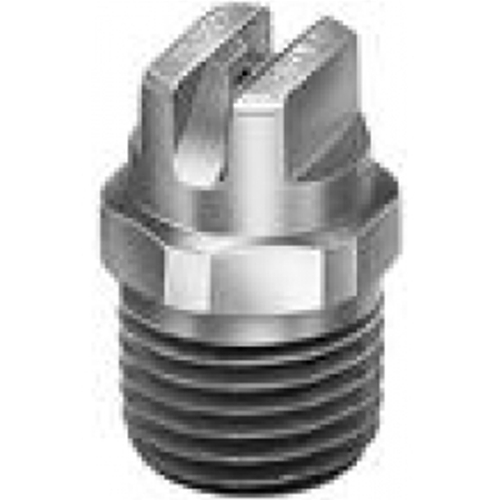 Model H-VV VeeJet nozzles feature flow rates below 1 gpm at 40 psi (3.9 I/min at 3 bar). Model H-U VeeJet spray nozzles feature flow rates of 1 gpm (3.9 I/min) and greater at 40 psi (3 bar). Open our VeeJet Spray Tip matrix by clicking on the pdf file below under "Documents"